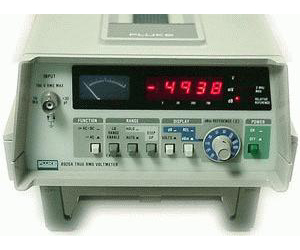 The Fluke 8920A is a wideband digital voltmeter with true rms ac with read-out in volts or dB and has a frequency range of 2 Hz to 20 MHz. The monolithic thermal converter within the 8920A provides wideband, low-noise, and accurate measurements. The unit also permits you to select any one of 12 reference impedances from 50W to 1200W and to digitally read out dB values referenced to the selected level.